So after my original centerpiece mock-up fiasco, my mom and I went in search of new ideas and inspiration. We finally found it at Hobby Lobby. They are taller/slimmer aluminum pails. We had to buy them in assorted colors since they didn't have enough of one single color, but that's no problem since my fiance was going to paint them white for me anyway. 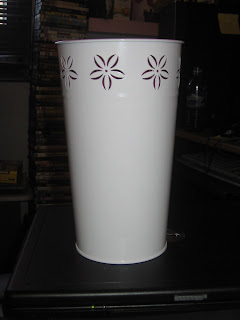 But here is the pail after it was painted.. The inside of them haven't been painted yet, but in due time! 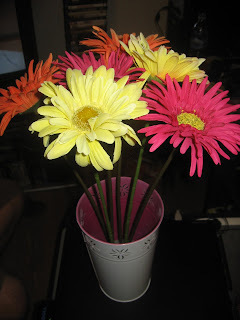 Since the "theme" of our wedding is revolved around bright colors and gerbera daisies, I loved how these had incorporated flowers around of the rim to kind of "fit" our theme. 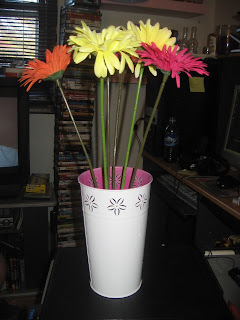 Here is a semi-mock-up of a centerpiece.. keep in mind that it still needs a lot of work! This only has 6 daisies in it right now, but our final products will have at least 9 in them with 3 orange, 3 hot pink and 3 yellow. Also I'm thinking about sitting them on top of our cloth napkins and with some votives or colored stones sprinkled around it. 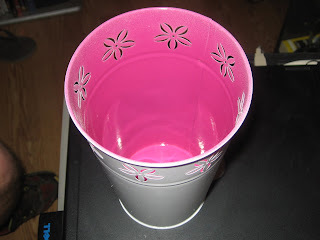 I plan to fill the pails with colored stones to hide the flower foam at the bottom of it. 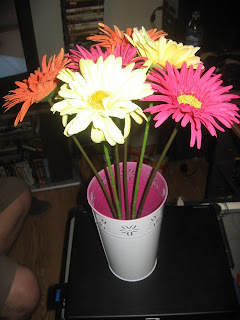 I will have a full centerpiece mock-up to post in a few weeks!